Who knew there was a noun for what we naturally have? What I love knowing about this definition of the word ‘Visionarieness’ is that this is something that we all share in common… ‘Having been marked by foresight and imagination’. We of visionarieness share an enthusiasm, a pure idealism and power of vision. 1. Given to or characterized by fanciful, not presently workable, or unpractical ideas, views, or schemes: a visionary enthusiast. Of the nature of a vision: illusory, incapable of being realized or achieved: utopian, existing only in imagination. 2. Given to likely see or are concerned with seeing visions. 5. Purely idealistic or speculative; impractical; unrealizable: a visionary scheme. Synonym- impractical, impracticable, fancied, illusory, chimerical, unrealistic. There is something disconcerting about parts of the definition of ‘visionary’. Especially when it is relates to, ‘impractical, fancied, illusory, chimerical, unrealistic.’ The definition bothers me. As a trained designer, I have been taught that everything that we see… including people and nature has been created by one who has VISION. The idea first thought of seen in our mind, then toiled over to be brought out into the world. Starting with the Divine Creator and the process of creativity, a birth-rite, handed down to and through us as humans on our spiritual journey. Being schooled was the place for practicing the expression of turning our visions from the inside-out. While in school it seems that visualizing forming a mental image of an idea or picture is the on-going practice of teaching our hands to catch up with our head. After honing this skill for years, many methods are raised to help in this process: Meditation; yoga; body movement/sports; dreaming; sketching and painting all help us to visualize. Manifesting the vision into our artworks, our lives, and the shape of our creative practice. So the synonym implies that a visionary is ‘impractical,” saying we are ‘incapable of being realized’, is simply untrue. 2. Given to able or likely to see or be concerned with seeing visions. 5. Intentional Creator, pure, idealistic, practical; realizable: a visionary. When we vision, we enter our own inner world. Sometimes we are in new spaces, entering territory unknown to our conscious mind. It is a path leading to understanding, tapping into a place deep within, that opens up cosmologies and worlds that are both uninhibited and free, and where there is some uncharted territory. I noticed in these definitions that the origin of the word ‘visions + ary’ was dated in 1640. Women Visionaries had ecstatic prophecy in Seventeenth-century England. More than two-thirds of the visionary women were Quakers. Feminist scholarship infused with their view of modern religion gave a fresh perspective to the visions. Fertile ideological and spirituality blossomed everywhere in the wreckage of long-established belief systems during this time of political turmoil. Some visionaries are considered modern day prophets as the visionaries of Medjugorje, who have been seeing and prophesying the ‘secrets’ given by The Divine Mother. And likewise earlier visionary medieval woman of mystical theology: Hildegard von Bingen, Mechthild of Magdeburg and Julian of Norwich, Hadewijch of Antwerp, Teresa of Avila, Angela of Foligno, Marguerite Porete played a role in their historical, cultural and political context. The role of physicality and the senses in mysticism are entwined with the theological content of their writings and methodologies. Earlier still throughout history and across cultures, shamans were the visionary wounded healers. First, they used their visionary ability to heal their own sickness and deal with their own near-death experiences. The individual’s energies were outwardly oriented and directed toward the community so that the trance and visionary journey served as a medium of communication between the supernatural or non-ordinary reality and the community. The shaman and the audience were integral parts of the visionary journey, and the ‘ecstasy’ ended if the connection was severed. Similarly, as Color of Woman School graduates, we are interested in serving our community with our innate ‘Visionarieness’… offering our gifts out into the world. The gateway to intuition and psychic sensitivity is the sixth Chakra is located in the center of your forehead. Learning to look at the world through your third eye and tuning into your psychic potential opens you to a deeper level of mystical, and intuitive wisdom. This literally expands your vision, helping you to see the many-layered meaning of everything in your world. Hindus believe that this area, known as the ‘Agna’, is the very portal through which all experience is channeled. Some forms of Tantric meditation focus on diverting the life force or kundalini energy that starts at the base of the spine and flows up through the body to the top of the head towards this area. The third eye is believed to be such a powerful and potent area that it is traditionally adorned as part of religious celebrations with small dots of color, called Bindhis. Red is often used, as this is the color of Shakti, or feminine power, and symbolizes love. Sometimes a yellow mark is added alongside as yellow is linked to mental activity. This powerful chakra can switch from ordinary vision to being able to see the whole dance of creation in an instant. Cultivating these centers in, and outside of our body as a way to express ourselves and align with our highest vision, is a way to access something that is invisible and give it form. When we see through this chakra and are divinely inspired, it opens up a oneness with the cosmos, empowering our lives as creative person. Our highest level of creativity is to align ourselves and express it. Accessing something that is invisible and giving it form, connect with our energy centers, so that we can align everything to our highest vision. Visionarieness helps us wake up and see the work and how we can take our wisdom to overcome any difficulties in life, outside of the cycles that trap us. 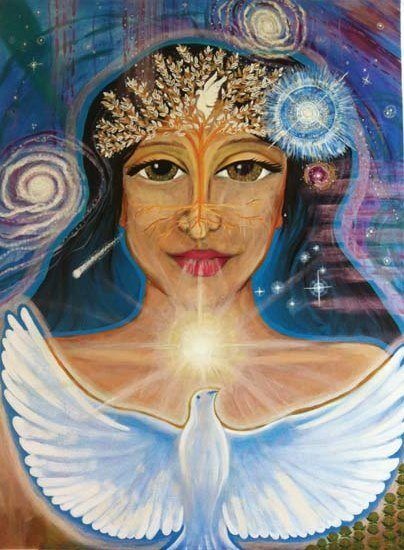 Transcending the experience with our power to emanate and manifest universal thoughts through our vision, creating our realities through our thoughts and inner visions. Insight occurs when you go into the unknown. You can learn how to navigate it intuitively. Flowing with the energy of this intuition, you begin to trust life more. Trusting that the people that you meet, and trusting that you can move into the direction of where you need to move into for growth. New experience of the future can be created where humankind will claim his own existence in harmony with nature and human kind. The access is possible, to experience something new, through the subtle power of our focused thought. It is necessary to desire it, to believe in it and to begin creating the visualization within ourselves. This must be cared for and nourished with the deep sense of gratitude and joy of the dream as already fulfilled. Subtle powerful channels of communication that work in harmony with universal laws, we receive important messages are reaching us from within. This treasure is something personal that also reaches a universal level. It is a joy of something you have worked for your whole life, now is the time of our fulfillment. At this point of evolution on this planet, mentally physically and spiritual create our lives in the flow of creation. Those that are leading will be going into the new paradigm, the time of fulfillment and create something that is totally new. How can relating to myself as visionary enable my process? How can I align and shift my vision to my true creative purpose? How can your intentional creative practice inspire a shared vision of the heart? Leslie Nolan is an artist by heart, designer by trade and teacher by design. As a entrepreneur and leader, Leslie’s has created “The Venus Transits Creativity Workshops for Woman.©” Teaching Intentional Creativity for individuals, groups and businesses devoted to guiding and shining a light for those traveling on the path of creativity, creating a life and business that is fully expressed. Leslie’s paintings are a visual diary; they articulate her emotions, concepts, and perceptions, using color as a source of vision and form as point of reference. Using complementary colors, creating vibrating intensities that evoke vitality. This color expression, reinforced by her graphics foundation, creates a potent marriage where color, symbol and design are vehicles for her wild internal visions. These visions contain imagery of a spiritual, allegorical nature, expressing a creative and controlling force of energy, either by means of a symbolic figure, The Divine Mother or a focal action, revealing truth on human existence.